On Wednesday, Nov. 12 2014, after over ten years and literally hundreds of millions of miles of travel, ESA’s Rosetta mission successfully put its Philae lander down on the surface of a tumbling comet 316 million miles from Earth. While Philae’s long-awaited landing was deemed a success, if just in that all primary mission science data was returned for its on-board experiments, it didn’t go without some hitches: while Philae did in fact touch down on comet 67P/C-G almost exactly where planned its dual harpoons failed to fire, causing the 220-pound robot to rebound off the comet’s surprisingly hard surface and soar to another location… twice. Unfortunately how Philae finally came to rest was at a tilt within a shadowed location, its solar panels shielded from the Sun. So once it began its science observations and communicating its findings with Rosetta orbiting nine miles overhead, Philae’s battery quickly ran out of voltage, eventually putting the robot into a low-power hibernation mode. But during Philae’s approach and initial bounce off the comet’s surface Rosetta’s OSIRIS imaging instrument captured it on camera – sort of a cometary version of “Where’s Waldo?” Check out the images above. These incredible images show the breathtaking journey of Rosetta’s Philae lander as it approached and then rebounded from its first touchdown on Comet 67P/Churyumov–Gerasimenko on 12 November 2014. The mosaic comprises a series of images captured by Rosetta’s OSIRIS camera over a 30 minute period spanning the first touchdown. The time of each of image is marked on the corresponding insets and is in GMT. 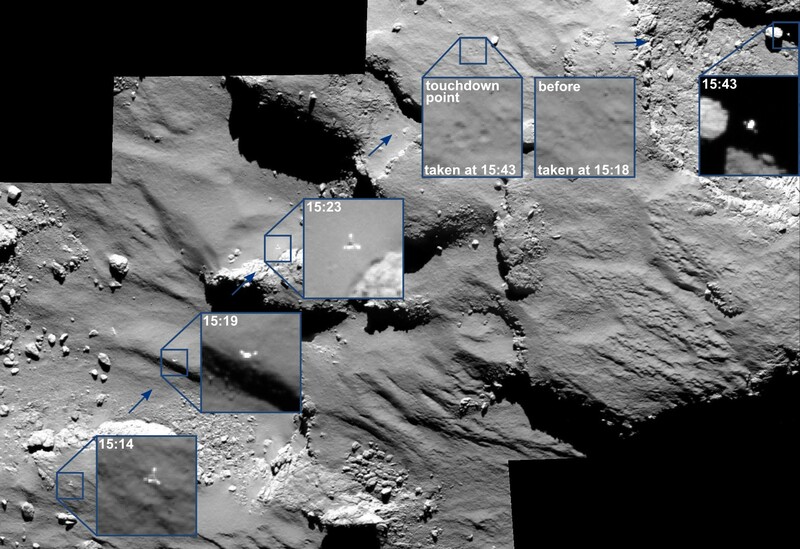 A comparison of the touchdown area shortly before and after first contact with the surface is also provided. The final location of Philae is still not known, but …the imaging team is confident that combining the CONSERT ranging data with OSIRIS and navcam images from the orbiter and images from near the surface and on it from Philae’s ROLIS and CIVA cameras will soon reveal the lander’s whereabouts. While it’s possible that Philae will eventually receive enough illumination to restore its battery and awaken as it nears the Sun, it’s far from a sure thing. But even if Philae remains asleep its mission was still a total success and Rosetta is very much awake and operational in orbit around 67P, and will continue to provide us images and data of the comet as it reaches perihelion next year. Read more about the Rosetta mission from ESA here. What a fantastic achievement this has been and continues to be! I find it so exciting that it all came together as well as it did! Hopefully, this will inspire governments to continue funding for projects like this (as they have to be constantly reminded). I am sure hoping for some sunlight to reactivate Philae! How exciting that would be! I heard an amazing factoid that the cost for the Rosetta mission was as much as the price of four commercial airliners! 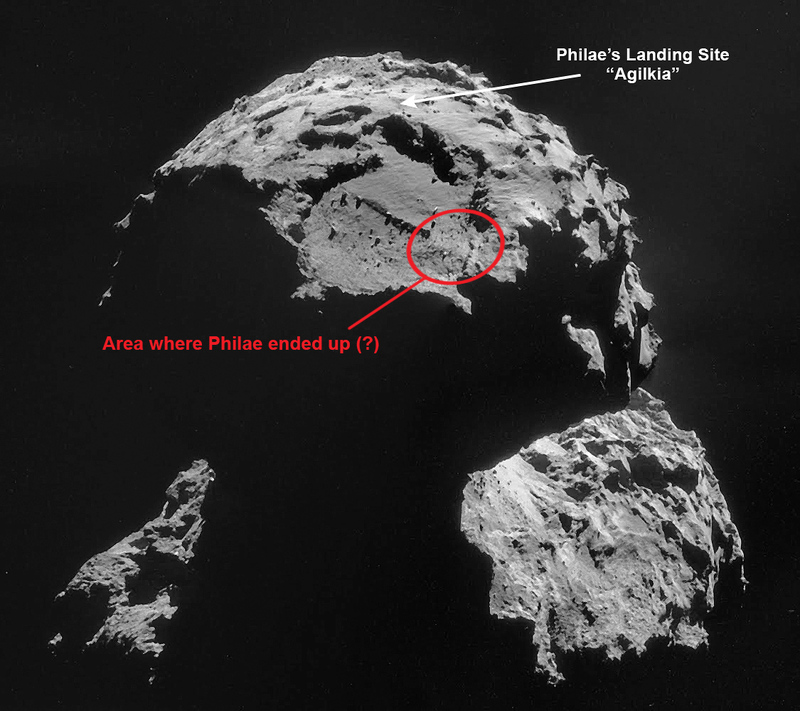 How do you correlate final location with the Philae’ flight direction to first contact point ? They don’t know exactly where Philae has landed yet.